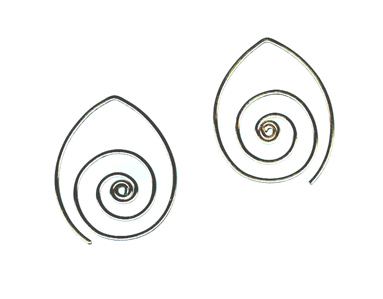 These spiral titanium ear wires are designed to be worn alone or to suspend a variety of interchangeable dangles such as the Pandora Compose earring charms for those with sensitivity to other metals. An elegant design in its simplicity, Linda has done the impossible in her creation of this design. Unlike gold or silver, titanium is not an easy metal to metalsmith. Handcrafted in USA from Grade 1 titanium wire -- the highest and purest grade of titanium available. Hand formed, milled and tumbled to hold the universal shape and to bring out the shine that is characteristic to finished titanium.